Ásthildur joined GRI in 2007. She has worked in different departments, as Manager for GRI´s Learning Publication, Senior Manager for GRI´s Report Services, and as Deputy Director for Guidance, Support and Innovation, where she was one of two project managers responsible for the development of G4. 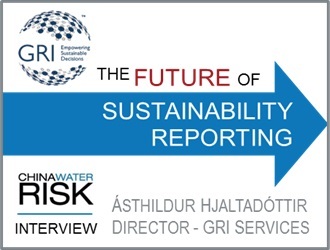 In 2013 Ásthildur was responsible for all GRI´s regional offices. Since February 2014 Ásthildur has been Director of GRI´s Services Department. She is also responsible for GRI‘s Regional Hub China. Ásthildur is originally Icelandic but also holds the Dutch nationality. Before joining GRI, she worked for international organizations in Brussels, Belgium and The Hague, The Netherlands. Financial reporting has long been the foundation of the finance sector but with growing environmental risk and rising uncertainty, the sector is paying more attention to environment, social and governance factors and their disclosure or what is also known as sustainability reporting. Moreover, regulations on sustainability is on the rise worldwide – from 180 policy instruments in 2013 to almost 400 now across 64 countries. The Global Reporting Initiative (GRI) is one of the leading organisations on sustainability reporting. Since 2000 it has been publishing sustainability reporting Guidelines and in October 2016, it released the first global sustainability reporting standard. We sat down with Ásthildur Hjaltadóttir, responsible for GRI’s Regional China Hub, to find out more on this new standard and future trends in disclosure. China Water Risk (CWR): The Global Reporting Initiative (GRI) was founded in 1997. The backbone of the organisation driving sustainability reporting has been your Sustainability Reporting Framework. Can you provide a short introduction on this and its evolution? Ásthildur Hjaltadóttir (AH): GRI is an international independent organisation that helps businesses, governments and other organisations understand and communicate the impact of business on critical sustainability issues such as climate change, human rights, corruption and many others. We have pioneered sustainability reporting since the late 1990s, transforming it from a niche practice to one now adopted by a growing majority of organisations. GRI’s Sustainability Reporting Standards are foundational to this success. In 2000, GRI launched the first version of its Sustainability Reporting Guidelines, representing the first global framework for comprehensive sustainability reporting. In 2002, the second generation of the Guidelines, G2, was unveiled at the World Summit on Sustainable Development in Johannesburg. The GRI Framework was designed to help all reporters prepare their sustainability reporting, regardless of their size or sector. Demand for GRI’s sustainability reporting guidance was steadily growing, and this was further boosted by the launch of the third generation of Guidelines, G3 in 2006. Over 3,000 experts from a variety of stakeholders such as business, civil society and the labour movement participated in G3’s development, highlighting the true multi-stakeholder approach at the heart of GRI’s activities. In 2011, the G3.1 Guidelines – an update and completion of G3, with expanded guidance on reporting gender, community and human rights-related performance was released. In 2013, GRI released the fourth generation of its Guidelines, G4, where the main focus was on material issues. G4 was divided into two parts, “Reporting Principles and Standard Disclosures” and “Implementation Manual”. In 2016, GRI released the GRI Sustainability Reporting Standards, the first global standard for sustainability reporting. CWR: In October 2016 the G4 Guidelines were replaced by the GRI Sustainability Reporting Standards, the first global standard for sustainability reporting. What are the key differences between these and how are the Standards improving sustainability reporting? New modular structure: The GRI Standards are organised as a set of modular, interrelated standards. The Standards bring together content from both the G4 Guidelines and the G4 Implementation Manual. Revised format with clearer requirements: The new format has clear distinctions between requirements (indicated by ‘shall’), recommendations (indicated by ‘should’), and guidance. Content clarifications: Key concepts and disclosures from G4 have been clarified to improve understanding and application of the Standards (e.g., how to define the topic Boundary, how to report on topics not covered by the GRI Standards, ‘employee’/‘worker’ terminology). Greater flexibility and transparency in how to use the Standards: For organisations preparing a report in accordance with the Standards as well as for those using selected Standards to report specific information. Restructuring/relocating selected content: Some disclosures and ‘Aspects’ from G4 have been merged or integrated into other sections in order to reduce duplication and to improve the logical flow of the Standards. These changes are set out in detail in the ‘Mapping G4 to the GRI Standards’ tool, available on the GRI website. Overall editing: Content from G4 has been edited for greater clarity and simpler language. For organisations that have already adopted G4, the changes are minor. The GRI Standards are built on the G4 Guidelines, which have been restructured into a set of modular, interrelated reporting standards. The GRI Standards include all the concepts and disclosures from G4, in an improved structure and with clearer requirements. The content is organised in a more straightforward way, with less repetition. No new topics have been added to GRI Standards. Throughout the transition from G4 to GRI Standards, care has been taken to preserve the focus on materiality, and to minimise changes to the G4 disclosures and their methodologies. Sustainability reporting is a relatively new practice and continues to evolve at a rapid pace, in order to meet stakeholder demands for non-financial information. Thousands of companies operating in Europe will soon need to begin disclosing this information under the EU Directive on Non-financial reporting. Additionally, the global Sustainability Development Goals also call upon countries to stimulate this type of reporting among the businesses in their respective jurisdictions. We have also seen a rise in the number of stock exchanges recommending or requiring that listed companies disclose sustainability information. The Global Sustainability Standards Board (GSSB) made the decision to restructure the G4 Guidelines into the GRI Standards, in order to ensure that our reporting framework can be used in all of these contexts. This transition will protect the investment organisations have already made in the GRI framework and the clarifications found in GRI Standards will lower the entrance barrier for organisations that are just beginning to invest in sustainability. CWR: There is increasing data showing that companies completing sustainability related metrics are performing better; regulatory risks in China are on the rise; and there is more uncertainty be it from climate change or politics. Do you see the new GRI Standards as the way forward to mitigate risks and seize opportunity? AH: Sustainability reporting can help organisations to measure, understand and communicate their economic, environmental, social and governance performance, and then set goals, and manage change more effectively. A sustainability report is the key platform for communicating sustainability performance and impacts – whether positive or negative, presents the organisation’s values and governance model, and demonstrates the link between its strategy and its commitment to a sustainable global economy. Every day, decisions are made by businesses which have direct impacts on their stakeholders, such as financial institutions, labour organisations, civil society and citizens, and the level of trust they have with them. These decisions are rarely based on financial information alone. They are based on an assessment of risk and opportunity using information on a wide variety of immediate and future issues. The value of the sustainability reporting process is that it ensures organisations consider their impacts on these sustainability issues, and enables them to be transparent about the risks and opportunities they face. Stakeholders also play a crucial role in identifying these risks and opportunities for organisations, particularly those that are non-financial. This increased transparency leads to better decision making, and thus a way forward to mitigate risks and seize opportunity. GRI provides a common language for businesses and their stakeholders to understand, manage and communicate this critical information. As more and more investors start paying attention to sustainability disclosures, the demand for this common language has increased. This is part of the reason why more than 45 countries and regions reference GRI in their policies and more than 35 of the world’s stock exchanges recommend GRI to their listed companies. The new GRI Standards will stimulate even more innovation in this space. The new structure will allow us to accommodate developments and innovation much easier, as individual Standards and disclosures can be updated, or new ones can be added, without the need to revise the entire reporting framework. When new best practices emerge we can integrate this into the Standards much easier, with minimal disruptions for reporters or stakeholders. CWR: Are companies already using the new Standards? How can GRI help with the transition? AH: Every reporting organisation takes a different path on their journey to transparency and sustainability and many experienced reporters are already in the process of transitioning to the GRI Standards and it is recommended to all new reporters that they start their reporting by using the Standards. Whatever route companies choose, GRI can guide them along the way. GRI has various programs it has in place in the GRI Support Suite. The Support Suite is structured as a cycle that mirrors the reporting process and displays tools and services offered at each stage. These tools and services can help a company to prepare a sustainability report, align reporting with the GRI Standards, give reports on exposure to a wider audience, and give insights into sustainability data. GRI has also established the GRI Standards Pioneer Program, an online program exclusively for the GRI GOLD Community, which was designed to support the earliest adopters of the GRI Standards after its launch in October 2016. Through a series of webinars, the program will provide reporting organisations with special insights on the GRI Standards, enabling the participants to share experiences and approaches with other organisations and with GRI. This program has successfully attracted around 100 participants. The GRI Standards also help organisations decrease duplications of reporting efforts because the Standards are aligned with other normative sustainability frameworks, including the United Nations Guiding Principles on Business and Human Rights, UN and ILO Conventions, and the OECD Guidelines for Multinational Enterprises. GRI has developed several linkage documents, which support the use of GRI Reporting Framework in combination with other widely used standards and reporting frameworks, such as the UNGC principles and related Communication on Progress (COP), the ISO 26000 guidance standard issued by the International Organization for Standardization (ISO), and the CDP. GRI recognises these linkage documents as strategically important for globally increasing the uptake of its Standards. With the expansion of GRI’s regional activities and presence, these linkages have also become important for local standards and guidelines. Our linkage documents are very well received by reporting organisations. Whilst GRI’s Standards have been designed to apply to organisations of any size or type, from any sector or region, sustainability reporting remains both global and local in nature, very much about time, place and community. A linkage document presents an opportunity to explain the GRI Standards in the context of – and in relation to – local policies, rules and regulations. CWR: There is already a wealth of disclosure data and much more to come. Do you think big data will impact how this data is used? AH: Our focus has always been on the reporting process and the value of the information that comes from it. While the sustainability report remains a crucial output of the reporting process, we must also ensure that decision makers have access to the high quality and reliable information they are increasingly demanding. Today we are seeing a wave of new ways in which information from the sustainability reporting process is being used by diverse groups of stakeholders to address their specific needs. But for this information to truly empower sustainable decisions in every organisation, it must be more accessible, comparable and available in real-time. Our role is to help the increasingly diverse range of users tap into the sustainability information they need, enabling them to use this information in more innovative ways. The sustainability landscape is constantly changing and we have always believed in the need for innovation. This is where technology and big data have a huge role to play. CWR: What role does third party verification play? AH: No one questions the utility and desirability of having financial reports verified by a disinterested third party: it increases the transparency and reliability of the reported information. At GRI, we believe this same reasoning applies to sustainability information and GRI has continued to recommend that organisations seek external assurance of their reports. Furthermore, the new GRI Standards will make external assurance a more straightforward process. GRI Standards come with much clearer distinctions between requirements, recommendations and guidance, which will make it easier for both the reporting organisation and assurance providers to know what needs to be reported and how it should be reported. CWR: Is China a priority country for GRI? Do you see potential for greater GRI uptake there? AH: GRI has a global presence with offices in North America, Africa, China, Latin America and South Asia. China is one of the most important markets for GRI reporting. According to the statistics from local consultancies and think-tanks, GRI is the most widely referenced sustainability/ESG/CSR reporting framework in China. In China, many stakeholders have taken a keen interest and are investing great effort in creating an environment which enables the promotion of responsible business operations. In China, there is a close connection between voluntary and mandatory approaches. Key regulators in China include the China Securities Regulatory Commission as well as the State-owned Assets Supervision and Administration Commission. Industry regulatory bodies and local governments follow the regulatory approach of the central government, while state-owned enterprises act as ‘pilots’ to set an example to others. Eventually, private companies follow suit by complying with supposedly voluntary initiatives. This system has effectively resulted in a high level of sustainability reporting, due to peer pressure. Additionally, with China’s commitment to UN Sustainable Development Goals launched in September 2015 for the next 15 years, we see great potential for GRI uptake in China. In addition to Mainland China, the Beijing office also attends to other markets in the Greater China region, i.e. Hong Kong, Macau and Taiwan. CWR: With the Standards, GRI is moving sustainability reporting into the future but what do you see as the steps after this? Does more focus need to be placed on Integrated Reporting? Should Stock Exchanges be pushing for greater mandatory disclosure? AH: There are a number of reasons the Global Sustainability Standards Board decided to transition G4 into the GRI Standards, including a desire to make our reporting guidance even more fit for reference in policy and regulations. Primarily, we wanted to make it much easier for the Standards to be updated to account for emerging best practice in sustainability reporting. That having been said, regulation on sustainability is on the rise worldwide. The 2016 edition of “Carrots and Sticks,” from KPMG, identified almost 400 regulations, guidelines, codes-of-conduct, frameworks and other reporting instruments – both mandatory and voluntary – across 64 countries. Back in 2013, that same study found only 180 instruments across 44 countries. GRI Standards were developed to fit with different regulatory and policy contexts, from voluntary to mandatory regimes. GRI works to enable smart policy on sustainability. We engaged government officials and policy makers to help ensure sustainability reporting was included in the Sustainable Development Goals (Target 12.6) and we recently submitted input to the US Security and Exchange Commission’s Concept Release regarding Business and Financial Disclosure required by S-K.
We acknowledge that in jurisdictions that mandate sustainability disclosures, a higher percentage of organisations do sustainability reporting and the quality of their reporting is usually higher than in jurisdictions where sustainability disclosure is done only on a voluntary basis.